A dramatic table that extends with ease from Bonaldo. BIG table with colour legs and wood top, showing extension. BIG table showing a close up view of the extension. BIG table in white, with glass top and white extensions. BIG table from above showing extensions. 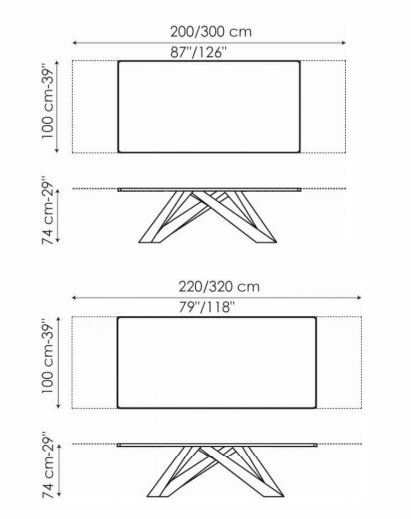 Dimensions for the Big Table 200cm (extending to 300cm) and 220cm (extending to 320cm). Top Finishes: Veneered Canaletto Walnut; Veneered Heat Treated Oak; White acid treated extra-light glass; or Black acid treated glass.